Every single one of us comes bawling and squirming into the world all bloody and gooey. There is nothing gentle or neat and clean about delivery, and certainly the same can be said about death. We are all equals at the beginning and the end of life. It is what happens in between that changes us. That is when some begin to believe that equality ends and they have risen above the rest of humanity. Every one of us, whether we are men, women, smart, average, rich, poor, well or sick, are basically the same organism. We all cry, hurt, get zits, bleed, defecate, laugh, cough, and breath. This is a short list of what we do as human organisms. The things that make us different from each other is how we think and learn and what we choose to do with the lives that our mothers gave us, and how we treat other human beings. No matter what we choose to do with our lives, we all have to struggle, learn, make friends, work, and best of all, love. As imperfectly perfect as human beings are, we are nothing without love. This is what is missing in healthcare. I am not talking about the marrying kind of love…the kind that often ends up producing new lives. I am talking about the kind of love that is for mankind in general. Compassion, understanding, caring, listening, patience, touch….that kind of love belongs in healthcare relationships between patients and professional caregivers. That is the “calling” that I had as a nurse and that so many of my colleagues had as well. We went into nursing to care for people and help them to get healthy and when that was impossible to gently guide them to death. We didn’t go into nursing to become bitchy cynical old crabs. Sadly, too many nurses and other providers end up that way. The system beats the love out of them and doesn’t allow time for it. There is no check box on the EMR for touching, or hand holding or spending time with a grieving family. Therefore it is not a billable moment. I want to share a few personal healthcare love stories. In 1969 when I was about 19 years old, I did my maternity and nursery nurses training. 3 weeks before I started nursing school in 1967, my baby brother Jamie was born. I never felt very maternal before that. I did a lot of babysitting as a teen, but I had no urge to have my own babies. Jamie changed that. I missed him terribly and he was growing so quickly between my visits home. So, when I met Molly (I am making this name up) I fell in love. She was perfectly perfect, but she only weighed 4lbs and came a little too early. She was the first African American baby or patient I ever cared for. I came from an all white community in Northern Maine, my only exposure to diversity was at intramural basketball games. I held Molly as much as I could. I loved Molly and I cried both happy and sad tears when her Mom and Dad took her home. This was my first awakening that humanity and love is color blind. A year or so later, I was doing Medical Surgical training. I was assigned to 2 older gentlemen. I was 20, so men in their 60s like I am now, seemed wicked old. One was a sweet Italian man with an accent, who was what we use to call compliant, and polite, and who did everything I asked him to without complaint. I’ll call him Ernie. I don’t remember Ernie’s medical problem so let’s say he had an ulcer…if he didn’t he would get one with his roommate. The second man (I’ll call him Bert) was a prominent Boston attorney, and he was boisterous, bossy, loud, nasty and even belligerent at times. He was an alcoholic and a diabetic. He would refuse to do what he was asked to do…even with a lot of explaining cajoling and nudging. He sneaked chocolates from Ernie and laughed about it. He was basically impossible!!! So, I approached Ernie with caution, but also with professionalism. I repeatedly told him that it was his choice, he could continue to do what he was doing and probably die prematurely, or he could take care of himself and I was there to help him. He figured out that even though I was green and young, that I wouldn’t cowtow to him and guess what….. He loved me! In fact he demanded that I come to his room and draw his blood rather than the lab phlebotomist doing it. I assured him that she was much more skilled at that than I was. Both men turned their health around during that stay. In a very short time, I fell in love with both of them and loved their teasing and joking around. After they were discharged, Ernie’s wife brought a large dish of genuine Italian homemade lasagne to my dorm! This was a token of appreciation and love from Ernie. Then the best of all…both Ernie and Bert came to my graduation. It was a surprise. Bert had lost weight and told me he was sober! He had been since he was discharged. Both of them gave me huge hugs and a nice gift. Their presence at my graduation was the best gift of all! 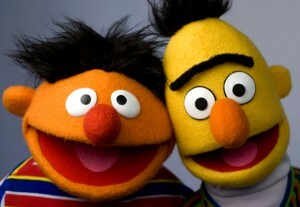 I felt like I had actually made a difference as a nurse, and I will never forget Ernie and Bert. I have cared for thousands of patients over my career. As an ER nurse, I gained skills at making a human connection with patients very quickly, and I could tell hundreds of stories. At the end of my career, I felt the humanity slipping away… I still loved my patients, but the lack of support and bureaucracy was a weight that I was ready to shed. Arriving at work and finding out that I would be understaffed, yet again was a killer. 12 hour shifts with no meal breaks broke me. In the end, hospital nursing sucked the joy of nursing out of me, I am sad to say. These are very old stories, but they are important ones. They are about genuine loving connections with human beings, not medical conditions. I am now starting to be on the receiving end of healthcare. I have been a patient more than I like this past few years. I had anesthesia 3 times last year for needed surgeries. I woke up all 3 times, crying. My caregivers asked me if I was in pain. “No, I said “I am just relieved”. I was also extremely grateful for their skilled and loving attention and for keeping me safe. I have felt that patient/provider connection several times during my experiences. Very special people work in our hospitals and doctors offices. Let’s make the changes we need to so those special people are not broken, like so many of us have been. Love, like water, is an essential part of our perfectly imperfect human lives and we need to bring it back to healthcare. On September 8, 2016, my colleague Poppy Arford and I co-presented at the Maine Patient Safety Academy. Poppy first introduced the Lown Institute, the origins and their incredible leadership. Then we encouraged our group to join our Healthcare Revolution with the Lown Right Care Alliance, and suggested ways to engage with us and our work. Our theme for this particular exercise/presentation was “What Worries You Most”. So, I shared my most pressing worries about Patient Safety, and then shared a story about my mother who is in assisted living. I worry about her health, safety and finances. I know her money will not last and that eventually she will have to move again. Change is extremely difficult for people with dementia. Wouldn’t it be grand if insurances helped to pay for what really matters for people. Dementia support and services are not covered by Medicare, but they would pay for an unending list of extremely expensive diagnostic tests, treatments and medications that would not make much difference for her at the age of 90. After our introduction and presentation, we asked our group of about 30 women, mostly nurses and other healthcare professionals, about what worries them most. This is when our session got really interesting. First they wrote down their own worries in just a few sentences. Then we gave them the floor, and they told us their worries. WOW! I still have a little lump in my throat. Maybe nobody ever asked these hard working dedicated professionals this question, especially at a healthcare patient safety conference. Their words validated my own worries and feelings, and they/we all validated each other. It was a moving and emotional experience for all of us. When a group of dedicated healthcare professionals say they are worried about something, everybody should be paying attention. Our RCA organizer Stepanie Aines has compiled the list of worries from our session, and I am including them in this blog. I am not shocked about most of these issues because I have worked in Patient Safety advocacy for 8 years now and I have heard most of them. I was so moved because these people were so enthusiastic and candid about their worries, and everybody in the room understood each other. We are all in this together, and that is the only way we can reform healthcare, together. We will find trends and priorities and then go to work for change! Poppy and I will be doing more listening exercises in listening booths over the next several weeks. 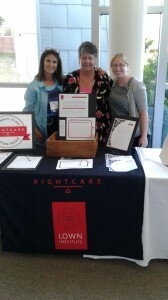 Right Care Action week is October 17 thru 21. If anyone who reads this is interested in doing one of these activities themselves, in their place of work or some other setting please contact me or the RCA. Links and contact information are at the end of this blog. We are also working to form a Right Care Maine chapter and would love to have Mainers who want meaningful healthcare change to join us. What worries you most about Healthcare? These are the responses from our group of dedicated professionals. -People I love being zombies – they are on wrong medications with awful scary side effects. Will that happen to me? -1) Patients on too many medications. 2) Where meds are coming from now. ie clothes and other items must show a country of origin, meds do not, including prescriptions. 3) Healthcare is the only purchase that we make where we do not know the cost until after the fact. 4) The waste in Mainecare when a patient can come to ED at anytime where others with regular insurance have to wait because it is too expensive. 5) Hospital infections v. falls. My mother passed due to Central Line Infection, Father from fall at a Nursing Home. -1) Not having all the information to make an informed decision about my care or the care of a loved one. 2) Not being able to take care for a parent who has failing health and children who have their own needs (i.e. college tuition). -Cost of Obama Care for retirees/folks on SSI – $700/month w/ huge co-pays and not all docs in network = substandard continual of care to folks that worked all their lives and paid into the tax system. -Working too hard to put food on the table and to afford proper things for my kids that I’m too tired to be there emotionally and mentally for them and my husband. I fear working for those expensive, yet necessary things will take away from making a life. -1) Affordable care. 2) My children won’t have resources and quality healthcare available to them. 3) High deductibles and HSAs are becoming the norm and more people cannot afford quality care. 4) Reimbursement from insurance companies is down – as a result quality practices cannot sustain practices. -The lack of beds and help for treating patients with mental illness. -Being stretched too thin. Having more and more tasks and responsibilities added that I cannot do my job safely. I am afraid that all the tasks will distract me from what matters most – patient care and safety. -Medical errors in healthcare safety. -Available affordable healthcare for all.